Click here to read what more people thought of our slideshows. Whether it's a motivational talk for students or an entertaining club event, theFreeClimber slide and multi-media shows may be tailored to your audience to make any occasion enjoyable and memorable. Our unique and spectacular slides will captivate your audience, but for the fullest experience choose one of our digital presentations accompanied by music, sound effects and film clips. Gain unique insights into the lifestyles and habits of indigenous people and their cultures. See the powerful mix of teamwork and individual effort, essential for success on a big-wall expedition. Hear funny and spectacular accounts of climbing at the very limits of possibility and often in the most unlikely of places. All of our extraordinary tales are informative, humorous, educational and illustrated from our huge slide collection. 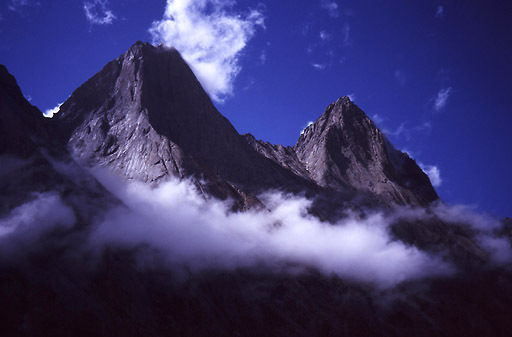 How an international team led by John made the first free ascent of this spectacular face in 2005 after 19 days of effort and 31 pitches, 9 of them E7! The wall is 1000m high and overhangs by over 50m. This third-time-lucky success realised a dream for John and Anne, who first tried the line in 2002 after watching an Eric Jones BASE jumping video. The show features a close look at ledge-life and the best of thefreeclimber.com photography. Amazing country, amazing wildlife, amazing people and amazing climbing! A brilliant trip with Gaz Parry, Jerry Gore and Giles Cornah. Not just an 800m granite wall encounter but a great insight into the idyllic sport-climbing off Madagascar's north coast. The local people, fadi's (taboos) and the unedited tales of Diego Suarez night club antics will offer a night to remember. John relates how he and Shane Ohly succeeded in each climbing 500 routes in one day as a mid-summer challenge. A multimedia tour around some of the Peak's best climbing, it includes many humorous interludes throughout this tiring 17-hour day. Many of the routes raced-up are easy enough for most climbers, but perhaps not all at once! A big effort and a long day out. Another mid-summer Ohly & Arran challenge day. 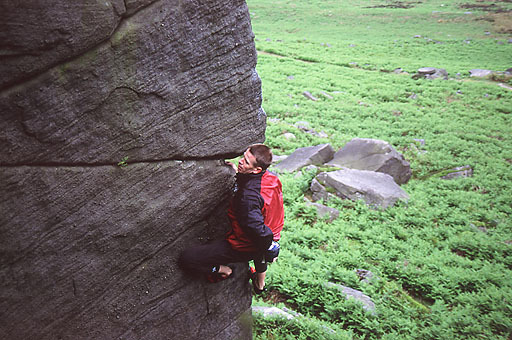 Contrast the long day of onsight concentration with five minutes of ultimate intensity as John trusts all to a hand-placed knifeblade on what may be gritstone's hardest lead. Esoterica: The ultimate challenge for the terminally insane! A short talk coupled with video footage of the making of the Slackjaw Film 'Esoterica'. 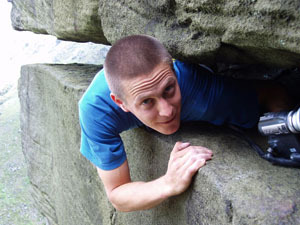 The 'On Peak Rock' Esoterica list combines charming classic climbs like the Kinder Downfall and the Matterhorn Ridge with vegetable-fests like Generously Cut Trousers and the ultimate nightmare of the tottering Mam Tor Gully. The challenge finished in the dark after 18 hours, 155 miles of driving, 5½ hours of approach and 423m of climbing. 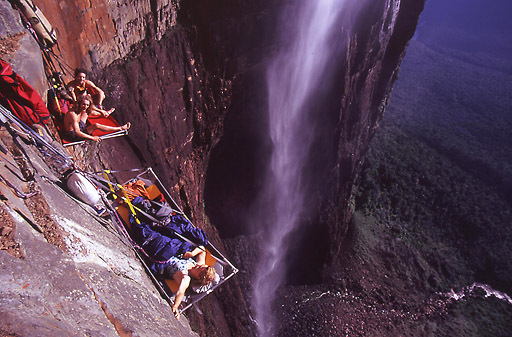 Inspired by the photography of Yann Arthus-Bertrand, this slideshow includes dramatic aerial shots over Venezuela's remarkable Tepui rock formations, taken both from a Cessna and also from the climber's perspective, high above the remote jungle of Amazonas and the Canaima National Park. 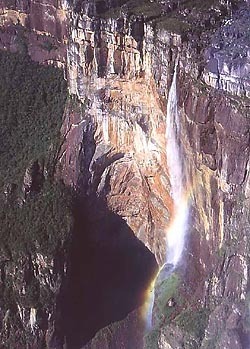 Features big-wall free ascents of Cerro Autana and Acopan tepui. With ancient wind-carved rocks high above the jungle floor, snow-capped Andean peaks, idyllic Caribbean archipelagos, impenetrable jungle, rare wildlife, curious creepy-crawlies and remote Indian tribes, this diverse and little-known country is more than worth a visit. Anne and John visited this valley with Ian Parnell and Mark Pretty at the same time as some Japanese tourists were taken hostage, and one year before an American climbing team were kidnapped. They completed a number of new routes before fleeing the valley, hiding among the yaks, after being told that Taliban were on their way! 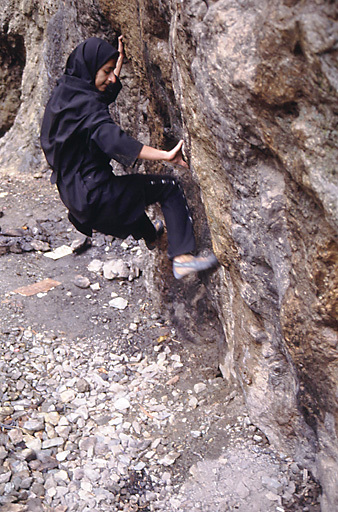 In 2001 Anne and John were lucky enough to be guests of the British Embassy and the Iranian Mountaineering Federation in Tehran, coaching the Iranian climbing team and finding time to free a hard multi-pitch route too. Contrast the Islamic culture and the adventurous climbing with Sinai, where more hard trad routes were established, as well as developing an extensive new bouldering area. 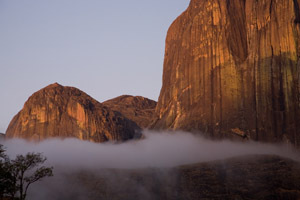 Two fascinating countries with a lot to offer in bouldering, sport and adventure climbing. Also consider combination talks of any of the above in two 30 minute sections, for example the sublime Madagascar to the ridiculous Esoterica. Prices will depend on the location and the audience, but could start at just £250. You can use the form below to request any further information or a quote for your perfect show. Please tell us the nature of your event, where it is to be held and roughly how many people you expect to attend. You can also find other ways to get in touch with us here.